Citation: Alrimawi I, Watson MC, Hall C, ALBashtawy M (2017) Child Home Injury Hazards: Observations from Palestine. Health Sci J. Vol. 11 No. 6: 541. Copyright: © 2017 Alrimawi I. This is an open-access article distributed under the terms of the creative Commons attribution License, which permits unrestricted use, distribution and reproduction in any medium, provided the original author and source are credited. Background: Unintentional injuries are a growing global public health problem that causes mortality, morbidity and disability among children. These injuries are most common among under-fives and form a significant burden on healthcare systems, particularly in low and middle income countries. Home environment is a key element in injury prevention that should be investigated. In Palestine there is a paucity of research in this area. Objective: To investigate potential safety hazards within homes and the mothers' interventions to reduce potential risks among their under-five years children in Ramallah district. Design: Qualitative, case study approach was used. Setting: This case study research investigated three types of residential setting (camp, rural and urban) in the Ramallah District of Palestine. Methods: Twelve mothers (four in each setting) were purposively selected to participate in this study through observing their home environments, and asking them for clarification around these observations. The derived data were analyzed using the content analysis. Unintentional child injuries are a major global public health problem and are one of the leading causes of mortality, morbidity and disability in children [1,2]. These injuries place a major burden on countries, particularly low income ones . In some countries, including Palestine, a major segment of unintentional injuries among children aged under five occur in the home, where younger children spend most of their time [3-6]. There is an association between home safety rating and home injury incidents . For example, a study in New Zealand by Keall et al. found that 38% of the injuries at home were linked with structural aspects of the home environment. They suggested that some repair work for the homes would be expected to decrease potential injuries. Similarly, Kendrick et al. conducted a cohort study which found that hospital admission rates were lower among families who used smoke alarms, stored sharp objects in a safe place and had fitted a stair gate. This also indicates that a safer home environment might potentially contribute in decreasing the number of unintentional child injuries. Some high income countries have achieved considerable success in child injury prevention [1,10]. There is a need to learn from the experience of these countries, and identify lessons that might be learned and applied to low income countries. In Palestine, unintentional injuries are one of the leading causes of death among 1-4 year-old children . In order to reduce mortality and morbidity rates, it is important to investigate the contexts of these injuries. Very few researchers have used observations for investigating home injuries, particularly in low income countries [12,13]. Attempts to investigate it in Palestine have been limited to date. There has been little research and most of it is quantitative, focused on the specific practices of parents at home [14,15], which does not illuminate the context of multiple causation in mishaps and accidents. In light of the absence of such data, this study aims to identify potential safety hazards within selected homes in Ramallah district, and mothers’ interventions to reduce the risks of these hazards among their under five years old children. Mothers were selected as they are the primary caregivers for young children in Palestine. This study is a part of a larger case study research project that looks at parents living in three settings (camp, urban and rural) within Ramallah District, as well as the surrounding context, with the aim of understanding the prevention of home injuries. A case study approach was selected due to the need to understand specific families’ situations , in order to illuminate core issues around the prevention of home injuries in different settings, and aid in generating a comprehensive perspective on this phenomenon. Furthermore, the work and its findings could offer transferable considerations for other settings which face similar contexts and challenges. In this study, observation was used to enhance understanding of potential hazards at home and to investigate safety principles adopted by families in response to these sources of danger. Ramallah District was purposively selected for this study, as a central city and one of the four main populated areas located in the West Bank of Palestine . Eligible participants for this study were mothers who attended the Central Immunization Clinic in Ramallah with the following inclusive criteria: aged over 18 years old, with at least one child under five years old. Mothers were recruited via information sheets distributed by nurses who work in the clinics. Initially, 21 mothers volunteered to participate in the study, however three subsequently withdrew. Twelve out of the remaining 18 participants were purposively selected to include variation in their residency, number of children, parental level of education, and economic status. A standardized hazard assessment checklist was specifically designed based on a validated tool developed for a high income countries [17,18]. Changes were made to make it more specific and relevant to the Palestinian context and to reduce the length of time that the observations would take. The tool was developed by the researcher (IA) and reviewed by an expert in child health from Palestine and two experts in child injury prevention research. Piloting was performed by observing three homes of parents with at least one under-five living in Ramallah District. Minor modifications were made after piloting. The final checklist consisted of 20 items and covered key potential injuries for the under-fives, including falls, cuts, poisoning, burns and scalds. Observations took place in the participants’ homes, after obtaining the participants permission. Each lasted for approximately one hour and was performed by observing the homes with the mothers and recording hazards onto the standardized checklist. The mothers were asked about some of the hazards to clarify if any actions were taken to minimize risks to children. Observation field notes, researcher reflections and the mothers’ self-reported clarifications were added to each item within the observation checklist. Finally, pictures were taken of specific aspects and a short description of each home was written. The total number of hazards within each home was calculated, whereby each hazard item was counted once. For example, hazards within the heating items were counted as one hazard. The numbers and items of hazards were compared in the three settings. The final narrative data were analyzed using content analysis . Approval was obtained from the Ethical Committee of the Medical School in the University of Nottingham, and the Palestinian Ministry of Health, thus written, informed consent was obtained from participants with all appropriate ethical observances expected of these institutions. The sample included 12 mothers (Table 1), 11 of whom lived with their spouses. One rural family had only one parent at home, as the husband was a prisoner of the occupying forces. Three mothers in the refugee camps and two of the rural mothers had education up to high school level, while all urban residing mothers had an undergraduate degree. Eight fathers had high school education, two had an undergraduate degree, and the remainder had postgraduate degree. Those with postgraduate degree lived in the urban setting. The selected sample represented some of the different educational levels of the Palestinian population . Table 1 The demographic characteristics of the participants. All fathers except the prisoner were employed, while only five mothers were employed; including the four mothers in the urban setting. In respect of economic status, it is notable that all families in the urban setting earned more than 2,237 ILS ($500) each month, while only one family in each of the other two settings reached this level. The percentage of participants whose income was below the poverty line reflected the overall rate in Palestine, which is 25.7% . The characteristics for the individuals for each setting were typical of individuals from each setting (Table 1). The number of hazards observed in the camp setting ranged from 10 to 13 per home. The hazards which appeared in the four homes were related to the following items: cleaning products, heating, electrical sockets, sharp objects, flooring and glass. Figure 1 is an example of an electrical hazard. 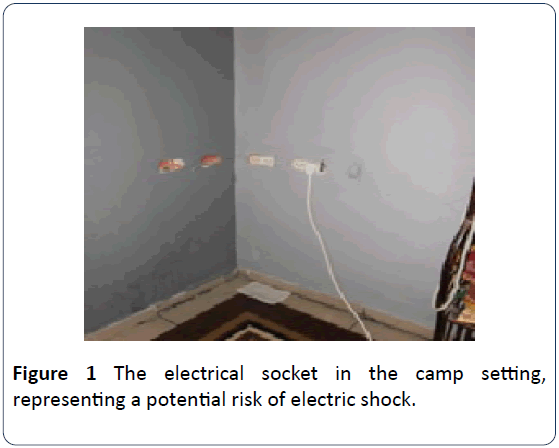 Figure 1: The electrical socket in the camp setting, representing a potential risk of electric shock. Some observed hazards could be linked with the mothers’ practices such as placing sharp objects (for example, scissors and knives) or glass utensils in a low drawer which could be reached by the children and keeping the medications in the refrigerator or in an unlocked lower drawer (Figure 1). Some families placed the cleaning products in unlocked cabinets under the kitchen sink. Moreover, some mothers kept these products in different containers, which increased the risk: one mother even kept pesticides under the kitchen sink in a lemonade bottle. Additionally, all homes included a gas or an electrical heater at a low height in the sitting room, and most kept gas cylinders opened in the kitchen where they could be reached by the children. Some mothers minimized the risk of certain hazards for the children. The mother of family 1 performed many actions to decrease risks; for example, she ensured that the door of the balcony was kept locked and did not allow the children to play there, because the balcony had a low wall without any protective handrails. Also, because the kitchen was open to the living room, she put furniture in the entrance of the kitchen to restrict the children from accessing the kitchen while she was cooking. Some observed hazards were linked with the structure of the home and the financial status of the family, such as having stairs without any rails or doors, and having a balcony or windows without any protective bars. The number of hazards that were observed in the rural settings ranged from 8 to 15 per home. Hazards which appeared in the four homes related to the following items: cooking utensils, heating, electrical appliances, and sharp objects. Some of the mother’s behavior increased the potential for home injury: these practices were similar to those of the mothers in the camp setting, mentioned previously. Some of the mothers’ actions in the rural cases that aimed to minimize the risk to children were insufficient. For example, the mother in family 2 stored glass utensils in a low cabinet in the kitchen without a lock, placing them in the inner side of the cabinet and telling the children not to open this cabinet. Such precautions would not completely remove the risk for young children. Some of the identified hazards could be related to the home structure and the family’s financial status. These were similar to the hazards identified in the camp setting. Additionally, two of the families in this setting used a charcoal brazier (kanon) to heat their homes (Figure 2). 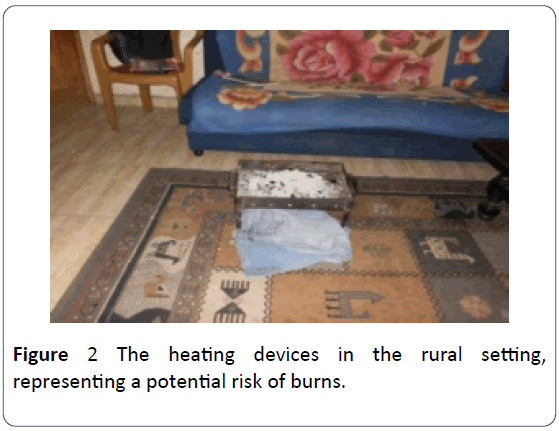 Figure 2: The heating devices in the rural setting, representing a potential risk of burns. The number of hazards that were observed in the homes of the urban setting ranged from 9 to 11. The hazards which appeared in the four homes were related to the hob, heating and electrical sockets. Some of the identified hazards in the urban families were linked with the mothers’ practices, similar to those reported in the camp and rural settings. Some of the mothers’ actions may have minimized the risk of certain hazards for the children. For instance, three mothers used ties to keep the doors of low height cabinets or drawers “locked” and preventing easy access to hazards, such as glass utensils and sharp objects. Another example of one mothers’ protective action was when she added adhesive tape to the corner of the carpet, to reduce the risk of tripping. 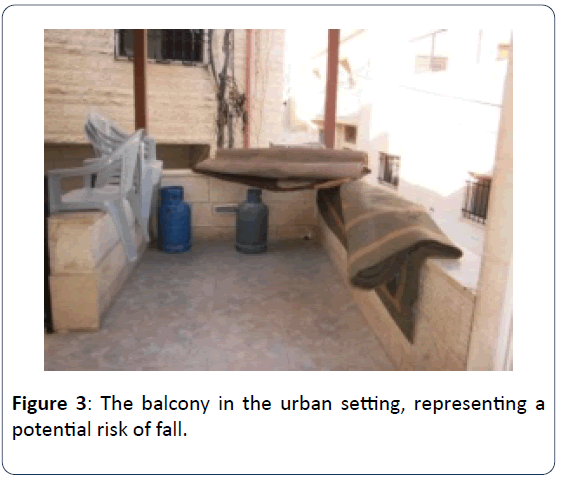 Other hazards could be linked with the home structure and the family financial status, similar to the camp and urban setting, such as having a low height balcony without any protective bars (Figure 3). Figure 3: The balcony in the urban setting, representing a potential risk of fall. Comparing the three settings: The observations of the homes indicated a similar high number of hazards among all settings, as presented in Table 2. The hazards that appeared for most of the families in the three settings were under the following categories: heating (N:12), electrical socket (N:11), sharp object (N:11), hob (N:10), and flooring (N:10). No water storage hazards were observed in any of the settings. Baby walker hazards also were not observed at the time of the study, although some of the families reported having them in the past (Table 2). Table 2 Hazards that were observed within the three settings. The observations showed that the number of hazards in the selected homes was similarly high in all three settings. These hazards reflected a potential risk for different injuries (burns, cuts, electric shock and falls) among the children. Heating hazards were seen among all families in all settings, indicating a particularly high risk for burn injuries among these homes. This finding of high number of hazards is supported by a previous systematic review conducted by Othman et al. in Eastern Mediterranean countries. The findings are also consistent with previous studies conducted in Palestine, which suggested that the number of home hazards might be high [21,22]. The WHO report on child injury prevention recommended the well-established E’s approach to injury prevention . One of the Es is environmental modification, which entails changing the built environment of the home or equipment to prevent injuries . Many studies have shown that engineering interventions can be successful methods for injury prevention in regard to hazard reduction [24-26]. However, the applicability of this intervention might be limited in the camp setting, or in the rented houses in the urban setting where families are not free to make improvements. It might also be restricted by the families’ financial capacity to implement the needed changes. Some of the mothers’ practices reflected a potential lack of awareness regarding injury prevention, which could be another reason for the high number of hazards observed. This highlighted the need for improving parents’ awareness around these home hazards. Lack of awareness as a barrier in the area of injury prevention was reported previously in other contexts , and is consistent with Raanan et al. in Palestine, which revealed that 47% of the parents felt that they did not have the required knowledge for preventing future injuries. Educating the parents regarding the risks and causes of injuries is another important strategy to support them . The low economic status of the families appeared to be a significant barrier in the area of injury prevention in Ramallah District. There is evidence to show the link between poverty and injuries in the literature . For example, Alptekin et al. found that the highest rate of home injuries was among low-income and unemployed families. This is particularly relevant to Palestine, because 25.7% of the population live in poverty . Therefore, the economic status should be considered by the policy makers and health professionals in their attempt to prevent home injuries. One option would be for them to provide financial support to the parents for the purpose of installing safety equipment in their homes. The overall study findings suggest that health professionals, particularly nurses, and other key stakeholders might have a key role in injury prevention in terms of educating families at clinics or their homes, spotting hazards if they visit homes, advocating improved home environments and changing and enforcing regulations (e.g. building codes) around this topic. Although education, environmental modification and enforcement can be considered individually, there is growing recognition that they are complementary and should be used in combination [1,30]. Moreover, in the wider field of health promotion, leading experts have for some time stressed the importance of combined approaches . Observations are generally considered a good way for detecting home hazards rather than relying on self-reported data . This study used a standardized checklist that had been piloted in Palestine to highlight home hazards. Nevertheless, in relation to the observational evidence, it is possible that the mothers changed certain aspects of the home before the observations, as they were expecting the home visits. Thus, it is possible that the results might be more positive than the daily reality of the families, however this would not change our conclusions. Although this study investigated home injuries in three settings within Ramallah district, it would be worthwhile to undertake research in other districts within Palestine. Additionally, the data for this study were collected in the winter, which might affect the results of the home observations. Future researchers may want to investigate home hazards in different seasons, and on a larger scale of participants. This study suggests that the numbers of hazards within the observed rural, urban and camp homes was high. Influencing factors included parent awareness, the structure of the homes and economic status of the families. In order to support parents in their injury prevention activities a combination of approaches is recommended including education, enforcement and environmental modification. The authors are grateful to the participants for the time that they devoted to participate in this study and for sharing their perspectives and experiences. World Health Organization (2008) World report on child injury prevention. WHO, Geneva. LeBlanc JC, Pless IB, King WJ, Bawden H, Bernard-Bonnin AC, et al. (2006) Home safety measures and the risk of unintentional injury among young children: A multicentre case–control study. Canad Medical Assoc J 175: 883-887. Alptekin F, Uskun E, Kisioglu AN, Ozturk M (2008) Unintentional non-fatal home-related injuries in central Anatolia, Turkey: frequencies, characteristics and outcomes. Injury 39: 535-546. Raanan R, Tarairah J, Ali W, El Jabari C, Endy-Findling L, et al. (2008) Incidence of home accidents in Palestinian and Israeli communities. Empowering Communities for Home Safety (ECHOS), Jerusalem. Othman N, Kendrick D (2010) Epidemiology of burn injuries in the East Mediterranean Region: a systematic review. BMC Public Health 10: 1471-2458. Kendrick D, Young B, Mason-Jones AJ, Ilyas N, Achana FA, et al. (2013) Home safety education and provision of safety equipment for injury prevention. Evid Based Child Health 8: 761-939. Hooper R, Coggan CA, Adams B (2003) Injury prevention attitudes and awareness in New Zealand. Inj Prev 9: 42-47. Keall MD, Howden-Chapman P, Baker MG, Kamalesh V, Cunningham M, et al. (2013) Formulating a programme of repairs to structural home injury hazards in New Zealand. Accident Analysis Prev 57: 124-130. Kendrick D, Watson M, Mulvaney C, Burton P (2005) How useful are home safety behaviours for predicting childhood injury? A cohort study. Health Educ Res 20: 709-718. Errington G, Towner E (2005) Injury prevention. In: Ewles L (ed.) Key topics in public health. Elsevier, Edinburgh. Pp: 119-127. Ministry of Health (MOH) (2012) Health status in Palestine 2011. PHIC, Nablus – Palestine. Gielen AC, Shields W, McDonald E, Frattaroli S, Bishai D, et al. (2012) Home safety and low-income urban housing quality. Pediatr 130: 1053-1059. Khan UR, Chandran A, Zia N, Huang CM, De Ramirez SS, et al. (2013) Home injury risks to young children in Karachi, Pakistan: A pilot study. Arch Dis Child 98: 881-886. Abu-Rmeileh N, Husseini A, Abu-Arqoub O, Hamad M, Giacaman R (2008) Mortality patterns in the West Bank, Palestinian territories, 1999-2003. Prev Chronic Dis 5: A112. Shaheen AA (2009) The epidemiology of injury in school-aged children in the Palestinian territory. London School of Hygiene and Tropical Medicine, London. Stake R (1995) The art of case study research. SAGE Publications, London. Tertinger DA, Greene BF, Lutzker JR (1984) Home safety: Development and validation of one component of an ecobehavioral treatment program for abused and neglected children. J Applied Behavior Analysis 17: 159-174. Mandel U, Bigelow KM, Lutzker JR (1998) Using video to reduce home safety hazards with parents reported for child abuse and neglect. J Family Violence 13: 147-162. Hsieh HF, Shannon SE (2005) Three approaches to qualitative content analysis. Qualitative Health Res 15: 1277-1288. Palestinian Central Bureau of Statistics (PCBS) (2012) Palestine in figures 2011. PCBS, Ramallah-Palestine. Sawalha AF, Sweileh WM, Tufaha MT, Al-Jabi DY (2010) Analysis of the pattern of acute poisoning in patients admitted to a governmental hospital in Palestine. Basic Clinical Pharmacol Toxicol 107: 914-918. 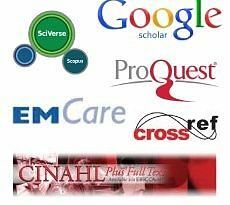 Younis R, Younis M, Hamidi S, Musmar M, Mawson AR (2011) Causes of traumatic brain injury in patients admitted to Rafidia, Al-Ittihad and the specialized Arab hospitals, Palestine, 2006-2007. Brain Injury 25: 282-291. Gielen AC, Sleet DA, DiClemente RJ (2006) Injury and violence prevention: Behavioral science theories, methods, and applications. Jossey-Bass, San Francisco. Towner E, Dowswell T, Simpson G, Jarvis S (1996) Health promotion in childhood and young adolescences for the prevention of unintentional injuries. Health Education Authority, London. Christoffel T, Gallagher SS (2006) Injury prevention and public health: Practical knowledge, skills, and strategies (2nd edn.). Jones and Bartlett Publishers, London. Hemenway D (2009) While we were sleeping: Success stories in injury and violence prevention. University of California Press, Berkeley. Simpson JC, Turnbull BL, Ardagh M, Richardson S (2009) Child home injury prevention: understanding the context of unintentional injuries to preschool children. Int J Injury Control Safety Promotion 16: 159-167. Pearn J, Nixon J, Scott I (2004) An historical perspective. In: McClure R, Stevenson M, McEvoy S (eds. ), The Scientific Basis of Injury Prevention and Control. IP Communications, Australia. pp: 5-17. Towner E, Mytton J (2009) Prevention of unintentional injuries in children. Paediatr Child Health 19: 517-521. Sleet DA, Gielen AC (1998) Injury Prevention. In: Sheinfeld S, Arnold J (eds. ), Health Promotion Handbook. Mosby, Baltimore. Poland B, Green L, Rootman I (2000) Settings for health promotion. Sage Publications, London. Mickalide A (1997) Threats to measurement validity in self-reported data can be overcome. Injury Prevent 3: 7-8.